It was the last Block of the month at Tri County! We’ve spent a year learning new feet, specialty techniques, and making new friends. Our educator, Debbie C brought in her finished quilt top and it was FANTASTIC. We can’t wait to see how everyone’s quilts turn out – they’ve been coming together wonderfully. We’re having one more meeting for everyone to finish up and piece together their quilt next month. We had such a wonderful customer appreciation day on Friday at Luke’s Tri County! 27 VIP customers stopped by for lunch and a free gift. Laquitta showed us everything we could do with the Aqua Magic Stabilizer. She had so much fun showing us how to make free standing lace, 3D flowers, in the hoop quilting and much more! Her enthusiasm sure was contagious. Elsmere finished up their Welcome Banner! This ambitious project combined multi-hooping embroidery, free standing embroidery, applique, piecework, and free motion quilting. No wonder it took two classes to finish! Our educator Connie did a great job walking through combining these techniques and made it so much fun. We can’t wait to see what her next class is! 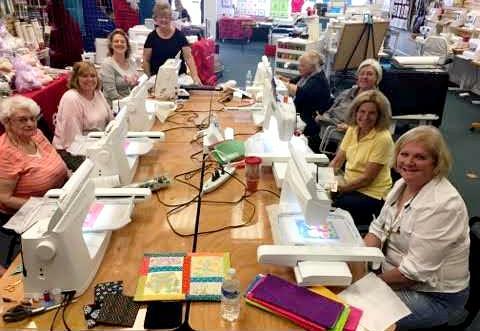 Saturday, May 27, Luke’s Tri County store hosted its monthly embroidery class. Our educator Laquitta walked us through these fun Anita Goodesign Shadow Work designs – perfect for a baby blanket or child’s room! We took a break from a busy say of sewing for a lunch of pizza, bread sticks, and salad from Larosa’s!